She's escaped the rat race, and is now officially living the dream! And we can't be more proud to have watched that journey unfold. 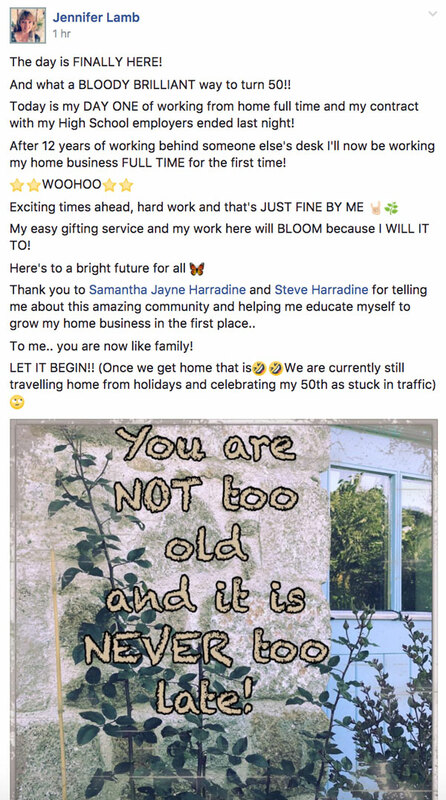 “You are NOT too old, and it is NEVER too late!” BOOM! She's living proof! Massive congrats to this amazing lady!! Shawn Johnson shared what happened to Mr. Antonio Starr this week inside the Private MLSP Facebook group. 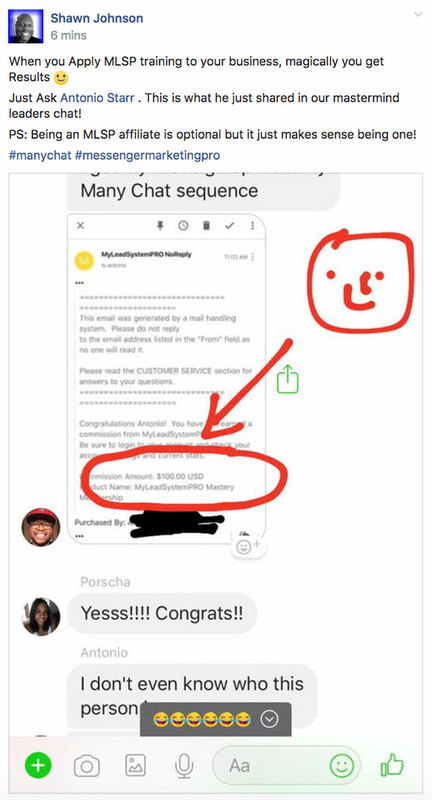 $100 commission from MLSP. All by following the training that MLSP gives. Congrats to Antonio! And thanks for the shoutout, Shawn! Here's what's cool. Victoria Amber House used the free training to her advantage to make this happen. It's all coming together for Bob “No Sweat” Swetz! This guy keeps moving forward like a freight train and we love watching it. Great work once again, sir! It made Colleen Burns's night to get that lead, and it's made our day! Those first leads are beautiful, and so will all the ones coming her way in the future. It's only the beginning! Great work, Colleen! Happy Anniversary to Jelena “The Russian Ninja” Ostrovska! Lisa Reed can't believe she's saying this. But we believe it, because we've seen her in action! We've watched her transition and it's been amazing to see. Great work, Lisa! Can't wait to see the product. Tracey Rose and Kat Mak are smashing out of the park with this video challenge strategy. 101 people is huge. Great work, girls!!! That's a lot of excitement for Colleen Burns. But rightly so. Why is she so darned excited? Because she just surpassed 10,000 likes on Facebook. At 2 cents per like nonetheless! 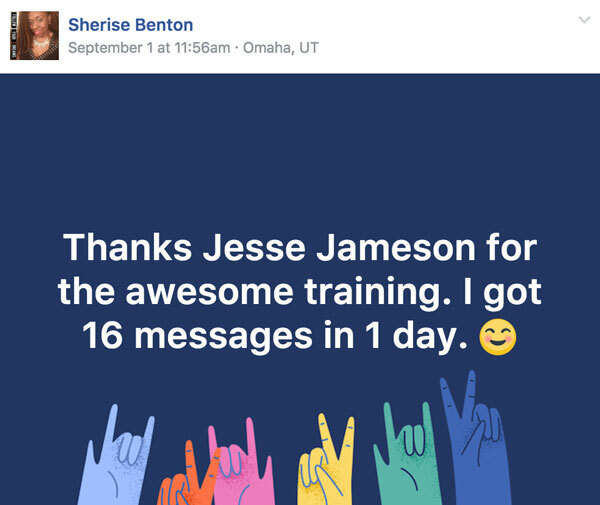 Sherise Benton has been following “the awesome training” that Jesse Jameson put together on using Manychat & Facebook Messenger Marketing! And the results are comin' in nicely! Keep it up, Sherise! Killin' it!!! When you get to Austin, you'll see Jean there whoopin' it up at our 10th Anniversary Black Tie event! Can't wait to see you there, sir! BOOM!! Zak Shahid is taking action and getting results. 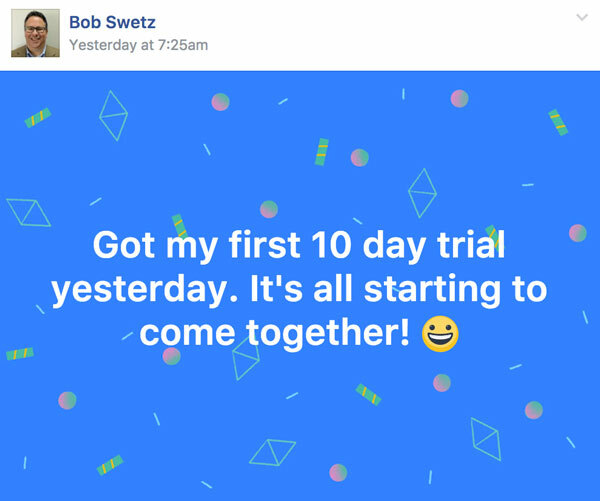 Clem B. Horn is putting Facebook Messenger ads to the test, and looks like it's working out for him just like it's been for everyone else! 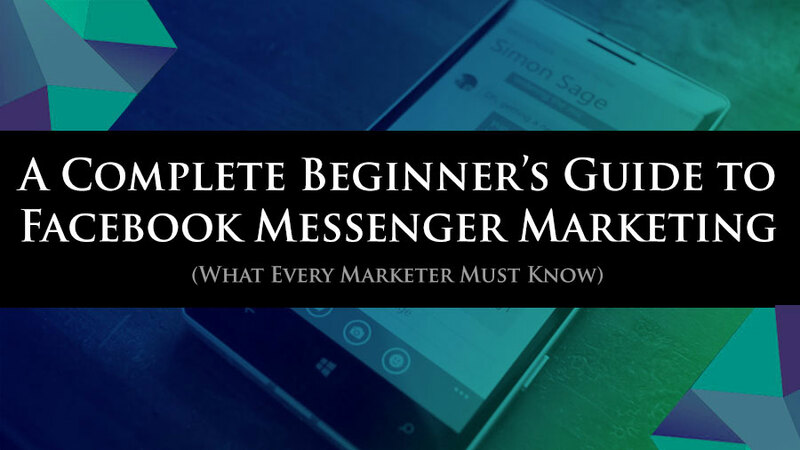 How do you create a Facebook Messenger Ad? Our cup runneth over in Ashleys! 2 in one post? 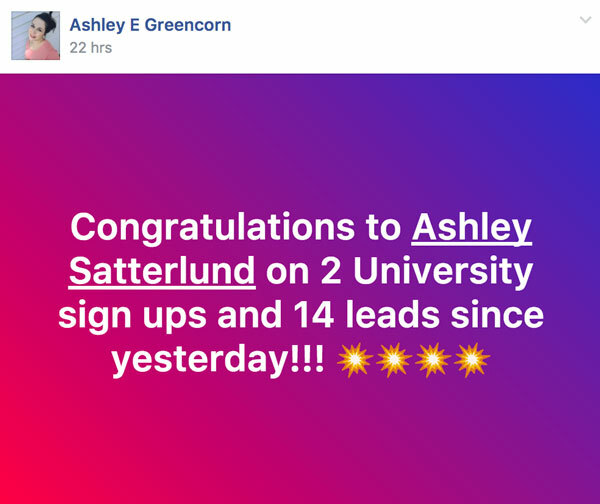 Ashley Satterlund just got a big ole shoutout from Ashley Greencorn for getting 2 sign ups and 14 leads. We love our shoutouts! This is proof that the MLSP Private FB group is the best community in the world. How did Melodieann Whiteley make this happen? How many other CEOs do you know that get in there on the front lines and show people exactly how to change their lives! Amie Orr is so proud of her peeps she's givin' them a very loud shoutout! You'll see what we mean below! 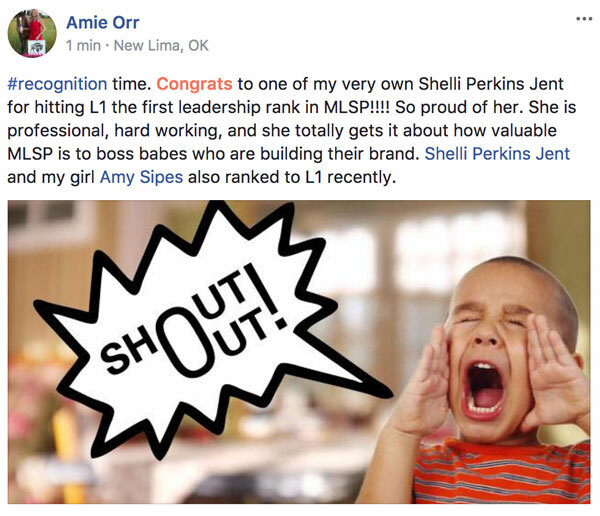 Congrats to Shelli Perkins Jent and Amy Sipes for your new L1 status! Great stuff coming for both of you!!! Once again, all these success stories coming from our community are meant for one thing and one thing only. 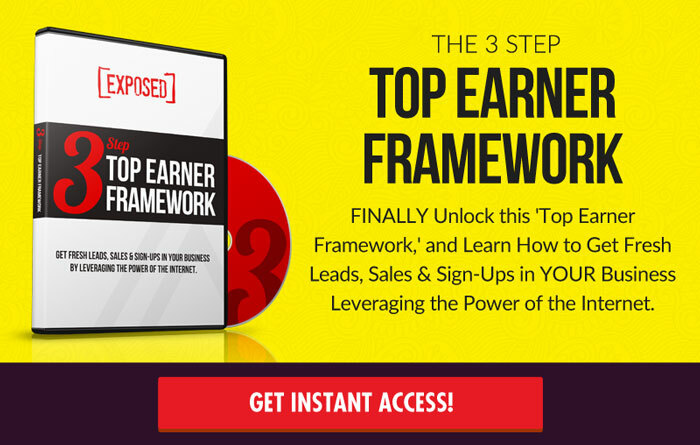 To show you what's possible when you take action, and implement the training! Every story comes form the Private and Exclusive Members' Only Facebook group. Now in the group yet? If you're ready to get to the next level in your life and your business, you must have support from people who are on your same journey! 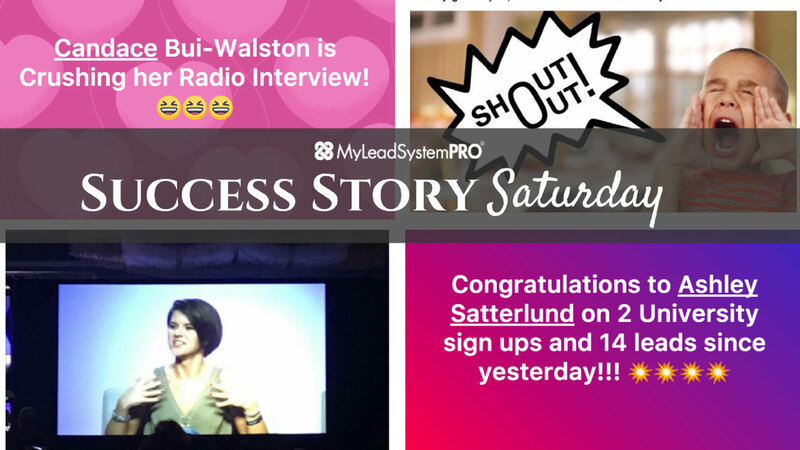 ==> Only MLSP Members Get Access to This Community!! !